The always evolving beast that is The Twilight Sad show their true colours once again. A reinvention of sorts while still maintaining that very raw emotion on top of the wave of notes and noises. The album (out on FatCat Recirds, Feb. 6) is No one can ever know and although guitars haven’t been chucked like a spent bottle of Buckfast, there is an emphasis on synths. From the get go, you see the band open it’s 80s electro synth wings with ‘Alphabet’. 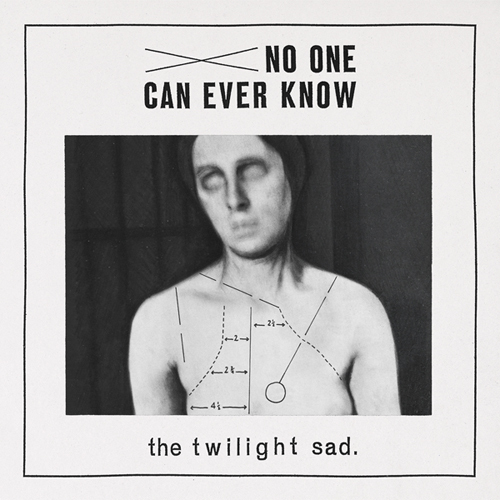 Heavy, jarring distortions have transformed into swelling notes always guarded by a steady, firm drumbeat (another signature sound of The Twilight Sad). It’s atmospheric and a top choice for an album opener. ‘Dead city’, on the other hand, is a little slower and, yup, a heckuva creepier. Its lyrics give the album its name and the 6 minutes runtime is a breezy. Again, a bit of a throwback to classy 80s (OMD melting with The Cure, says a friend), this is the track that will sound delish on vinyl. ‘Don’t move’ even has some accordion (I think) thrown in it for anyone missing the oldest sounds of the band. Emotions clash. Those feelings of memories (good and bad), longing and hoping for the bitter to pass seep through in songs like ‘Sick’ (awesome vocals, great synth), the dancey ‘Another bed’ and the extremely gloomy (and lovely) ‘Not sleeping’, a song so cold and with the feeling of loneliness of a barren permafrost wasteland. The crown jewel is ‘Nil’. The intro is haunting and the electronica sounds they are aiming for is perfectly achieved. Best of all, the essence of the band is never diluted. The aforementioned ‘Not sleeping’ is hot on its heels, mind you. It’s always a treat when the creative muscle flexing of a band works quite well and even more so when it’s a band with great lyrics and powerful emotions like The Twilight Sad. No one can ever know is another step in their musical path and the ideas touched upon on the fantastic remixes in The Wrong Car EP (specially the Errors’ remix) are fully absorbed and expanded by the band. The Twilight Sad Website. Last.fm. Facebook. Spotify. Twitter. Posted in reviewsTagged FatCat, No one can ever know, The Twilight SadBookmark the permalink.